This little gem of a restaurant on Memorial had been calling our name for some time. So what better time to try out their Sunday brunch than during Houston Restaurant Weeks? Hungry’s has a parking lot in the back of the restaurant, but there’s also complimentary valet. When we arrived around 12:30, the restaurant was busy and full of patrons – lots of families and people visiting after church. The hostess suggested we go next door (literally it’s called Next Door Bar & Lounge) where there was less of a crowd. We asked if it offered the same menu as Hungry’s … she said yes. So we obliged. While Next Door Bar & Lounge was literally a stone’s throw away from Hungry’s, the vibe was completely different. It felt very laid-back and fit for adults. And it was significantly less crowded. We seated ourselves and perused the menu. 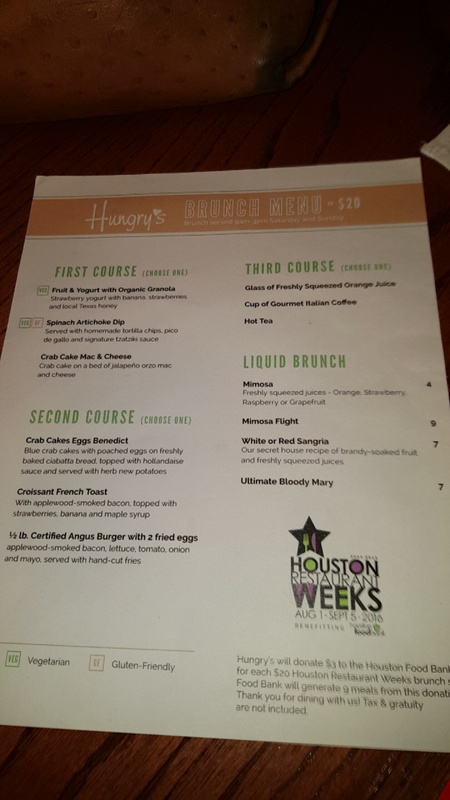 Their Houston Restaurant Week’s brunch menu was actually a great deal – three courses (one was just beverages) for $20. 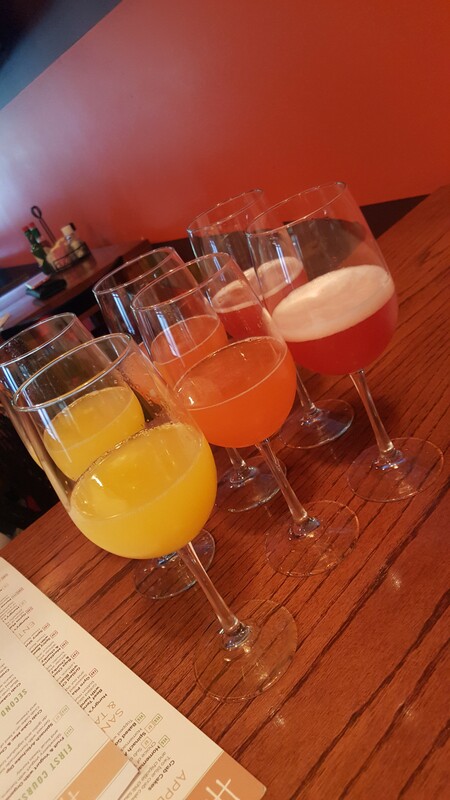 And the best part: mimosa flights were at a discount – three for $9. You could choose orange, raspberry or strawberry. So of course we had all three! Strawberry was a standout! Now, for the food: we opted for crab cake mac and cheese (first course), croissant French toast (second course) and glass of orange juice (third course). The first course was – we’ll admit – surprisingly very good. Crab cakes can be hit-or-miss. It was a good size, literally the size of the platter and quite flavorful. The mac and cheese was made with orzo pasta and wasn’t super cheesy. Did we mention it had bacon pieces in it? 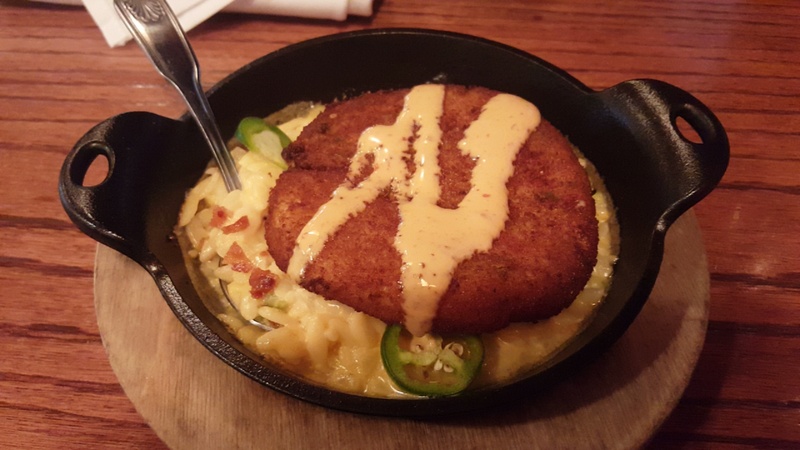 It worked out well to serve as a complement to the crab cake, rather than overpower it. The sliced jalapenos topped it off nicely. The second course was massive. 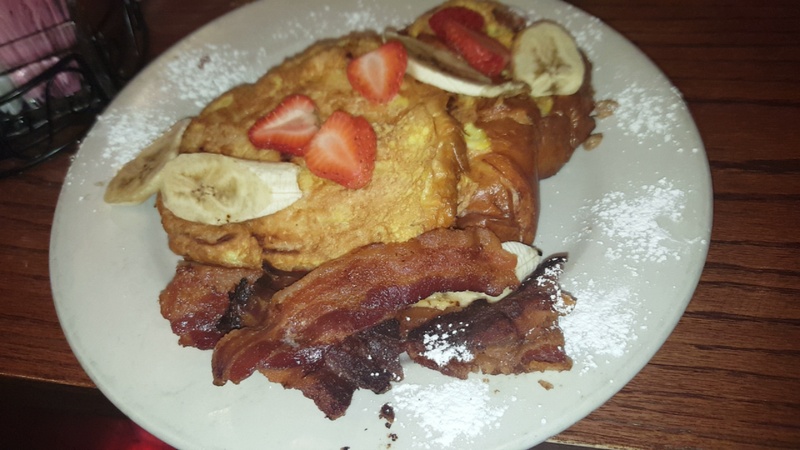 Three pieces of French toast with a croissant flaky-like texture topped with sliced strawberries and bananas, served with bacon and topped with maple syrup. I mean, how can this not be good? It was an awful lot of bread, especially after already having the first course. We couldn’t finish it all, but packed it up to take home. The third course was almost unnecessary at this point. Couple sips of orange juice and we were through. Overall, Hungry’s is a cool spot and there are a few menu items – and cocktails – that we didn’t get to, so we definitely have to visit again. A weekday evening dining outside of Next Door Bar & Lounge doesn’t sound bad at all! Hungry’s is located at 14714 Memorial Drive, Houston, TX 77079.